What Is Metabolic Balance Plus? Through our experience of running Metabolic Balance at WeightMatters, some people need more rigorous psychological support to help them maximise their weight loss results and change their eating behaviour. Metabolic Balance Plus gives you just that with expert short-term focused therapy to help you get your mind on track with the psychological, emotional and behavioural changes that are part of Metabolic Balance. How Do I Know If I Need Metabolic Balance Plus? Do you find yourself sabotaging your weight loss efforts? At times do you reach for food to comfort yourself after a stressful day? Does changing the way you eat fill you with fear? Do you believe you will fail at Metabolic Balance? If you can answer YES to any of the above, then Metabolic Balance Plus is for you. In the same way your body is being rebalanced with optimal nutrition, your thinking needs de-cluttering and updating. Combine the two together and you are onto a winning formula for weight loss success. 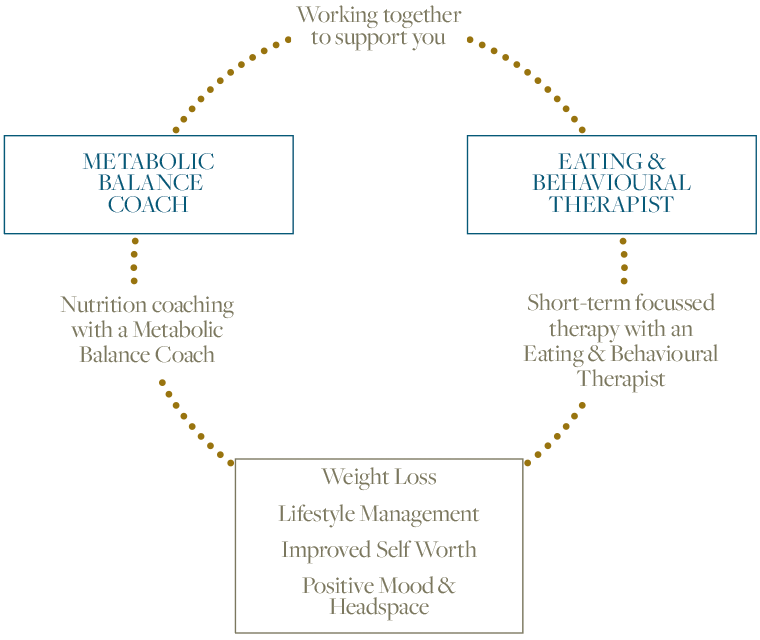 You work with both a Metabolic Balance Coach and one of our Eating and Behavioural Therapists to support you in losing weight, changing your habits and updating your headspace. We recommend you start with weekly therapy sessions as you start the Metabolic Balance Plus programme, as this will be the time when we need to challenge your thinking and unhelpful habits. After 4 weekly sessions we then suggest you come every other week in the second month of the programme. You may choose to add on additional sessions if you feel the support is beneficial and it is helping you to stay on track. After your initial Metabolic Balance session, you will then come in generally 7-10 days later to go through your personalised eating plan. Your third session in the first month will then be arranged before you start Phase 3 of the programme. We recommend you then have your remaining 3 sessions of Metabolic Balance Coaching on a week you are not seeing your Eating & Behavioural Therapist, so that you maintain weekly support in the second month of your programme. You will then have 1 or 2 sessions of support remaining in your third month of the plan. Once again, you may choose additional sessions of support moving forwards as and when you need them.